This is my second pair of this same shoe.Comfortable right out of the box. Quality excellent. Both for the uppers and lowers. Good design, very nice looking. I love these shoes and will continue to buy them as the need arises. 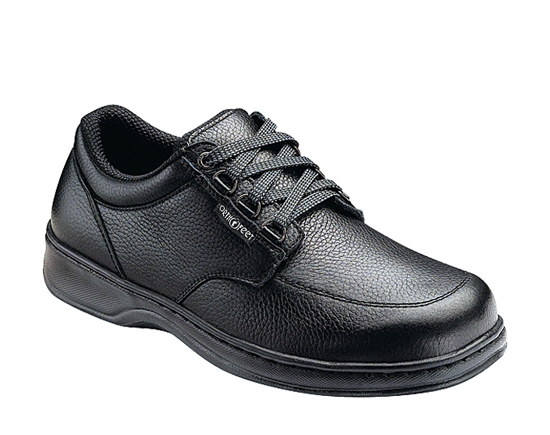 I do not need to where diabetic orthopedic shoes. I only do so because of the comfort they offer.My only gripe and it's a minor one is that the "D" rings for lacing seem to slip and go side-ways. On my older pair I have replaced the "D" rings with conventional metal eyelets. The most comfortable shoes my husband ever had for his work. He is all day on his feet and having plantar fasciitis makes it so much worse. These shoes are a life-saver! Amazing support, easy lacing, but most important is width! These shoes comes in varieties of width to chose for your comfort and benefit. from now on, this is our go-to place for the shoes. Not the most attractive shoe in my opinion, but they do help with the foot problem. Im very happy with the shoes I bought and will buy them again when I need them. I WOULD HIGHLY RECOMMEND THESE SHOES TO ANY ONE THAT HAS FOOT PAIN.